If you are interested in hosting a community benefit event or a donation drive for Primavera, contact our Volunteer Coordinator at (520) 308-3110 or volunteers@primavera.org. Are you seeking funding from individuals, businesses, and/or organizations to finance this event? If so, please indicate the names/types of donor prospects you intend to approach. Has this event ever take place before? If so, when? For official Primavera logos to be used in promoting your event and to review our brand standards, be sure to visit our Press Kit. You can use Facebook's Fundraising Tools to raise funds and awareness of Primavera on your birthday, or set up a dedicated page to rally around a specific fundraising goal. Because we use their payment platform to process donations on Facebook, supporters pay no fee. So, 100% of the donations go directly to the organization. EASY TO START - Facebook will help you get started and give you tips to reach your goal. SHARING IS CARING - Connect friends to your cause and gain supporters across Facebook. EASY TO GET DONATIONS - People can donate to your fundraiser in just a few clicks without leaving Facebook. 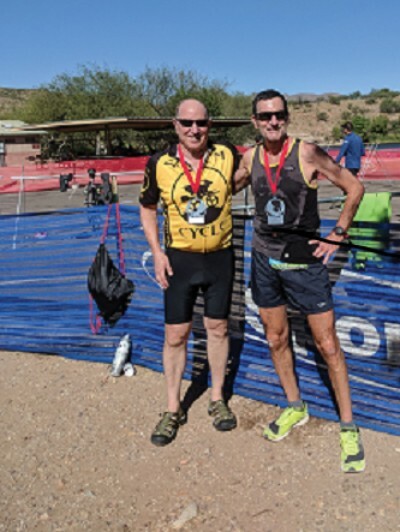 After swimming 1,500 meters, bicycling 1,900 feet, and running 10 kilometers in three hours and 27 minutes, our Primavera Board Treasurer, David Wohl, and his friend Dan Mendelson won second place in their division of the “Tri-ing for Shelter” Patagonia Lake Triatholon fundraiser. With the help of over 20 of their closest friends, they raised over $3,600 for our Men’s Shelter.